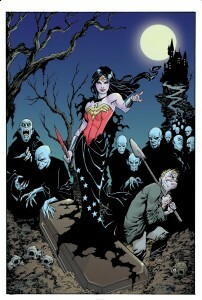 I was recently given the opportunity to illustrate a variant Wonder Woman cover for DC Comics. 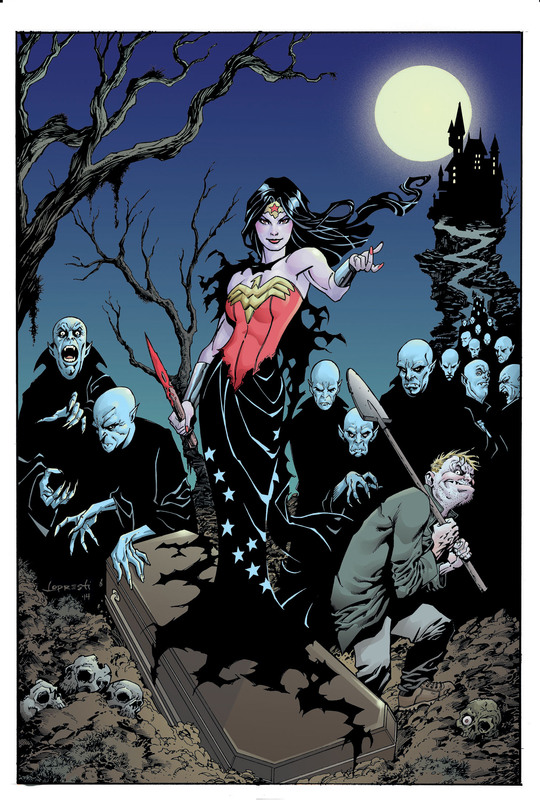 October 2014 is monster variant cover month at DC and I got to work on the Wonder Woman cover for this event. It is a return, all be it a short one, to the title that most people associate me with so it was an exciting assignment for me. This cover job was a little different for me in that I was given no content direction except that it had to be monster related. 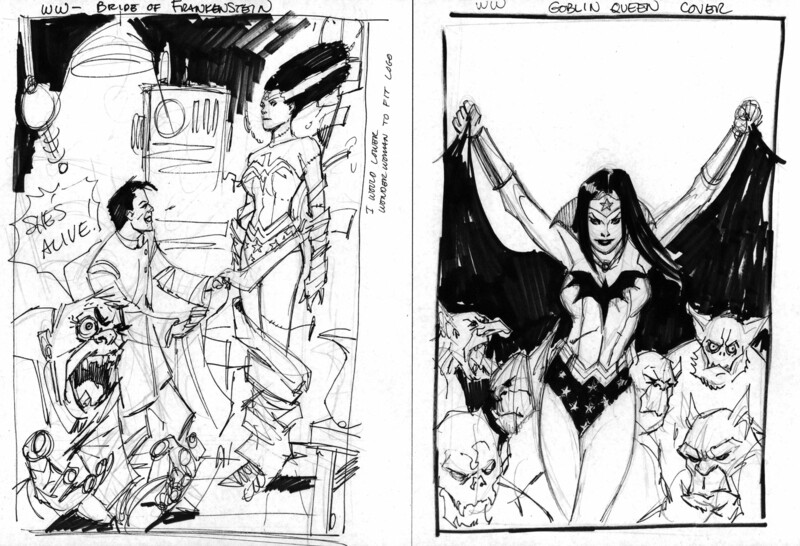 So with nothing but visions of monsters dancing in my head, I came up with these four concept roughs. 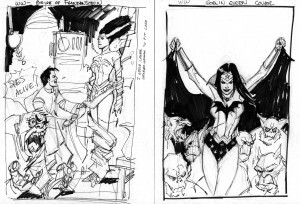 As I put it to DC Art Director Mark Chiarello, the vampire and zombie cover concepts are the best, the Bride of Frankenstein is the funniest and the Goblin Queen is just uninspired exploitation. Secretly I wanted to do the Bride of Frankenstein version but I knew it wouldn’t be approved because of possible copyright issues. So I put my efforts into the vampire version because it still allowed me to draw Wonder Woman as a beautiful woman as opposed to the zombie cover which would have presented a much less attractive version of the amazon princess. 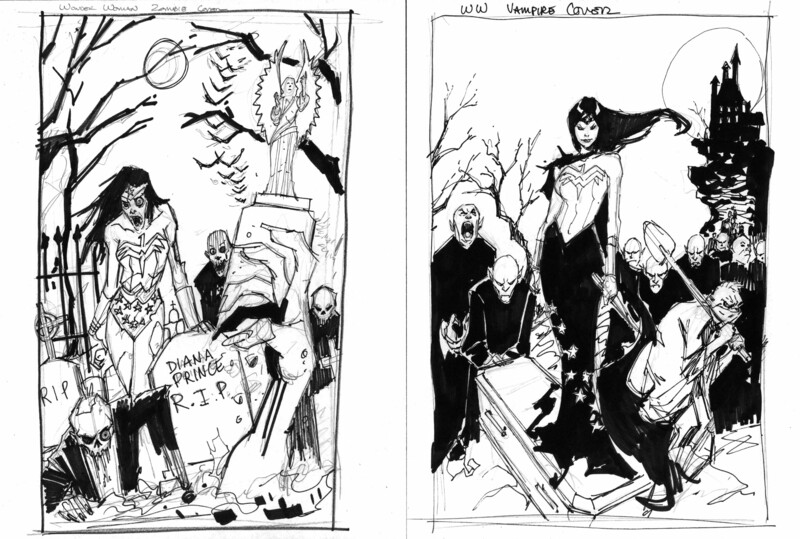 It could be argued that the zombie version is a better layout but the vampire version won the day. Normally I will do a large rough and then transfer that on to the final art board. This time, however, I really liked the energy of the figures in the large rough so I just turned that into the finished pencil that you see below. 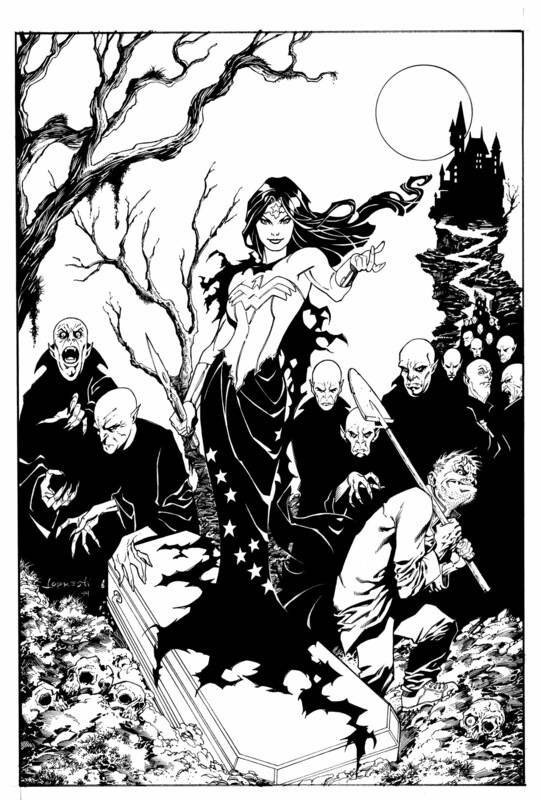 I then inked this using some brush and a lot of pen to finally come to a finished black and white piece. I really want to get to a point where I am coloring all of my covers as well as inking them. So even though I am a painfully slow colorist, I opted to color this myself. It wasn’t very cost effective for me but I am happy with the result so that’s all that matters in the long run. So there it is. 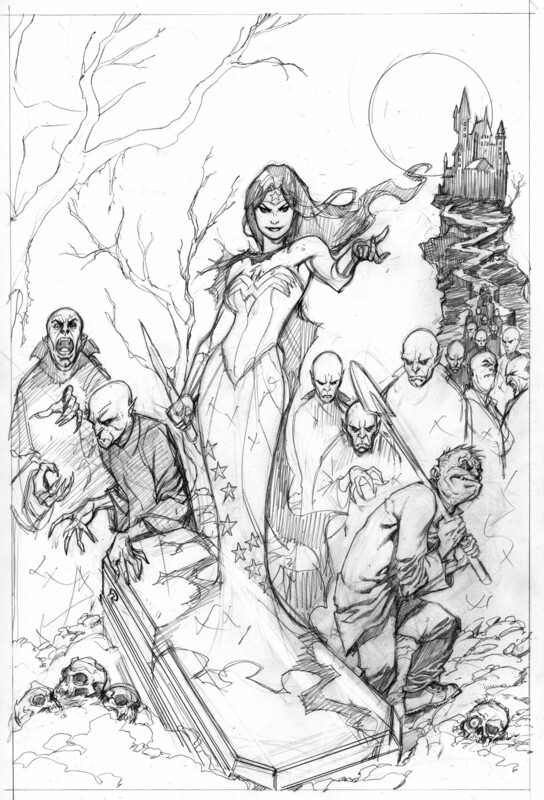 Start to finish my four step process to this cover. Hopefully I haven’t seen the last of Wonder Woman.